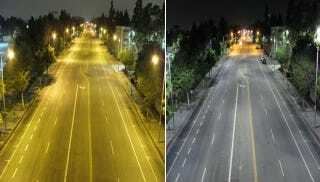 The decision by the city of Los Angeles last year to replace its high-pressure sodium streetlights—known for their distinctive yellow hue—with new, blue-tinted LEDs might have a profound effect on at least one local industry. All of those LEDs, with their new urban color scheme, will dramatically change how the city appears on camera, thus giving Los Angeles a brand new look in the age of digital filmmaking. As Dave Kendricken writes for No Film School, "Hollywood will never look the same." Kendricken specifically uses Michael Mann's 2004 film Collateral as his example of a movie that relied heavily on the depiction of Los Angeles at night. Mann deliberately set the film in L.A.—actually relocating it to L.A. from NYC, where it was originally going to be filmed—not only due to the narrative mechanics of the screenplay but because of the particular color tones of the city's nocturnal streetscape and how they would appear when shot with digital cameras. Mann's well-known urban aesthetic, and his propensity for shooting films digitally, thus came together in Los Angeles under the unlikely banner of the city's antiquated streetlight infrastructure. Surely, though, nothing is really being lost in this transition to LEDs? Filmmakers and photographers can simply fake the old color scheme in post-production—after all, that's what things like Photoshop are for. As he points out, the color effects of LEDs are not, in fact, easy to mask. "The interesting thing about non-tungsten artificial light sources," Kendricken writes, "is that they often produce a non-continuous or incomplete spectral output. This can affect the appearance of certain colors under that output. More simply, you can't really put colors back in that weren't there to begin with, even by gelling such a light source or color correcting in post." As such, he suggests, the switch to LED really is a historic change for the visual definition of Los Angeles—so much so (and this is my comment, not Kendricken's) that we might someday find ourselves seriously arguing over whether a city's artificial lights, due to their unique color scheme, could be justifiably subject to historic preservation laws. After all, Kendricken adds, "In a sense, every night exterior L.A.-shot film previous to this change is rendered a sort of anthropological artifact, an historical document of obsolete urban infrastructure." Lead image and all other comparative Los Angeles street shots courtesy of the Los Angeles Bureau of Street Lighting; film stills from Michael Mann's Collateral courtesy of Paramount Pictures.